The best-known planting procedures will not save a tree that is poorly suited for its site. If trees can not tolerate site conditions they become stressful and more acceptable to many pests and diseases. One of the best ways to deter this is in the planting process. A tree planted in the right site will have an easier transition into its new environment and influence the long-term performance. When planting, it is important to remember that flooded and compact soil causes lack of oxygen causing trees to use respiration and its reserves. Trees that are not corrected from this environment are susceptible to possible death. Once you have decided what species to purchase, take the time to examine the trees trunk and roots. A damaged trunk can lead to decay and disrupt vascular system flow; it can also be an entry site for insects and disease. When examining the roots, be sure to look for healthy roots which will be a white or light tan colour. Avoid roots that en-circle the trunk. Check to see if the overall tree is solid with little or no movement at the trunk. Be sure to take these steps when selecting your tree, to give it every advantage and avoid any unnecessary stress. Deciduous tree must be planted in the spring as soon as frost is out of the ground, or in fall from leaf-fall until freeze up. Poplars, willows, ash, elms, and birches tend to over-winter better if planted in spring. Conifers can be planted in early spring up until four weeks after deciduous trees have opened their leaves. In the fall, plant first week of August to the end of October. There are many important steps when choosing and planting trees or shrubs. Our staff have the knowledge to help you choose what is suitable. We can also prepare the tree or shrub for planting and the proper size hole and methods which will ensure roots have easy penetration and transitions into their new environment. Place the tree at the proper height. Before placing the tree in the hole, check to see that the hole has been dug to the proper depth’Äîand no more. 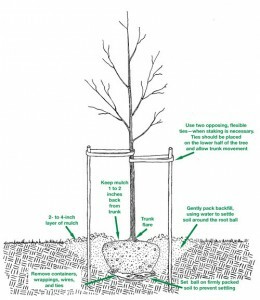 The majority of the roots on the newly planted tree will develop in the top 12 inches of soil. If the tree is planted too deeply, new roots will have difficulty developing because of a lack of oxygen. It is better to plant the tree a little high, 2 to 3 inches above the base of the trunk flare, than to plant it at or below the original growing level. This planting level will allow for some settling (see diagram). To avoid damage when setting the tree in the hole, always lift the tree by the root ball and never by the trunk. After you have completed these nine simple steps, further routine care and favorable weather conditions will ensure that your new tree or shrub will grow and thrive. A valuable asset to any landscape, trees provide a long-lasting source of beauty and enjoyment for people of all ages. When questions arise about the care of your tree, be sure to consult your local ISA Certified Arborist or a tree care or garden center professional for assistance.